HealthSherpa Reviews: Is It a Better Way to Enroll in Obamacare? Consumers who need to buy health insurance through the Obamacare marketplace can turn to HealthSherpa to find plans that are presented in an easy-to-understand, user-friendly way. HealthSherpa Review: Is It a Better Way to Enroll in Obamacare? HealthSherpa is a website that provides you with recommendations for healthcare marketplace plans based on your income, family size and the frequency with which you visit the doctor. 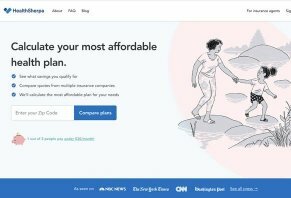 What makes the site unique is that they’re one of the few sites that allow you to do all of your enrollment through their website without ever having to go to healthcare.gov, the site where you’d normally sign up for an “on-exchange plan” which refers to health plans you buy through helathcare.gov. The company is based in San Francisco and was founded in 2013. HealthSherpa’s CEO is George Kalogeropoulos, whose resume includes a stint as president of a Bay Area analytic company RentMetrics and a year of service in Greece’s army. In this review, we’ll provide our analysis of HealthSherpa based on our experience with using the site. We will tell you how the site works, compare it to Healthcare.gov and then talk about the site’s pros and cons. HealthSherpa helps you get plans available through the healthcare marketplace, which features plans available to those who aren’t eligible for healthcare plans through their employer or through Medicare, Medicaid or CHIP. These healthcare plans are commonly known as “Obamacare” or “ACA” (Affordable Care Act) plans, although Obamacare/ACA is far more extensive than just a set of healthcare plans you can buy online. Either way, if you don’t have insurance through your employer, then you can choose a plan directly through Healthcare.gov or through a helper site like HealthSherpa. As a 1099 worker, I’ve used Healthcare.gov to buy healthcare plans since 2015 so I was genuinely curious to understand how HealthSherpa worked. I went to their site and clicked on “Find a plan” in the top right corner to get started. The application process is very similar to Healthcare.gov but it was far more streamlined. The site asked us for our zip code, our county, and then our age and gender. The age/gender page also inquires about whether or not you are a smoker. Click “Yes” if you’ve smoked at least four times a week for the past six months. Answering “yes” to the smoking question may increase your premiums (what you pay each month). Answering “yes” to the question about your eligibility for other healthcare plans may disqualify you from getting a marketplace plan. These are the same questions you’d get if you applied on the Healthcare.gov website. Once you answer these questions, you’ll have to tell the site how many people are in your household and how much your pre-tax income should be for the year for which you’re applying. What we like about this process is that, after you put in your income, you get a screen telling you how much you’ll save each month on your healthcare plan. HealthSherpa doesn’t dictate how much you save. Rather, this number is the result of the maximum federal tax subsidies that are applied to your account. Once you get into the final stages of your application, you’ll have the chance to choose how much of that savings number you want to use. Following the savings page is a page asking you how much you think you’ll use your health insurance. There’s a low, medium and high option. We chose low one time through and high the other time through and it didn’t affect the recommended plan that HealthSherpa gave us. The next three pages are important and are nearly identical to the Healthcare.gov. They’ll ask you if you have any preferred doctors or hospitals you want to use, and if there are any prescriptions you need to take. While you might be inclined to skip over these two pages so you can see how much your plan costs, don’t. Enter your primary care doctor and any specialists you have, as well as your prescriptions. When HealthSherpa shows you your plans, they’ll also tell you if your doctors, hospitals and prescriptions are covered. For example, when I did a test run of their process, I entered my doctor’s name. When I saw my plan results, I discovered that my doctor would no longer accept my current plan next year. Had I chosen to continue on with the plan via Healthcare.gov, I may not have known this (more on that later). What we’ve just described the past few minutes is the extent of the preliminary application you fill out with HealthSherpa. It is not unlike the Healthcare.gov application. However, there are some distinct differences, which we’ll point out in a few minutes. Once you finish the preliminary application, HealthSherpa shows you one plan they believe is the best fit for you. You’ll also see if the doctors, hospitals, and prescriptions you chose are covered by the plan. If you are someone who is healthy and you don’t make many visits to the doctor -- if any – then this information most likely will be sufficient for you. However, if you know you need certain procedures done in the upcoming year, are pregnant or have an ongoing chronic condition, then you’ll want to view the plan’s details. You’ll discover how much various types of care cost, including hospital stays, imaging and other procedures. Now, keep in mind, these are all prices that Healthcare.gov provides and are not something that HealthSherpa generates on its own. Once you find a plan that fits your needs, you’ll be redirected to the Healthcare.gov site to finish up your application. After open enrollment ends on Dec. 15, HealthSherpa notes that they provide support and advice throughout the year. HealthSherpa doesn’t provide any information that you can’t find on Healthcare.gov. Where it excels, in our opinion, is in their design. The way that they organize their application and present their plans is, visually speaking, easy to understand and doesn’t feel overwhelming. For example, when you click to see more details about a plan, HealthSherpa presents the information in list-form, stating how much you’ll pay for certain types of care and providing a drop-down menu you can click on to get further explanation about the particular type of cost in question. Healthcare.gov presents the information in a similar way but, based on our experience, HealthSherpa’s presentation is much more user-friendly. This is an excellent example of how HealthSherpa doesn’t provide you with any information or health plans that you can’t get on Healthcare.gov but, based on this example and our overall experience, they present that information in a much clearer way than Healthcare.gov, which is a crucial advantage for people who are using the healthcare marketplace for the first time or have used Healthcare.gov but are frustrated with the way information is presented. The final main difference between the two sites relates to the doctors, hospitals, and prescriptions you identify during the application. HealthSherpa will show you in your plan results whether or not those preferences are covered. Healthcare.gov, on the other hand, doesn’t show you preference eligibility in the results; you have to click “Quick View” to see them. As you can see, HealthSherpa makes a doctor, facility or prescriptions eligibility in the plan in question clearer. Our first-hand experience with HealthSherpa and Healthacre.gov indicates that HealthSherpa is a more pleasant experience both in the way they design their application process and the way that they present information about plans and plan details. In this sense, HealthSherpa makes the healthcare marketplace much more approachable. However, we want to point out that the information about plans that you get on their site is no different than the information you get on HealthCare.gov. Furthermore, Healthcare.gov, while not as user-friendly as HealthSherpa, is still a pretty easy site to use. You’ll have to provide a lot of personal information up front in order to get your application started, whereas HealthSherpa asks only a few simple questions before showing you your plans. In general, we think HealthSherpa is an excellent choice for someone who appreciates good website design and wants to choose health plans that are presented in a conversational way as opposed to the stodgy language used on HealthCare.gov. At the time of publishing, the downside to the site is that you still have to connect to Healthcare.gov in order to finish your application. We believe the user experience would be much better if you could do the entire application on HealthSherpa. Write a Review for HealthSherpa!